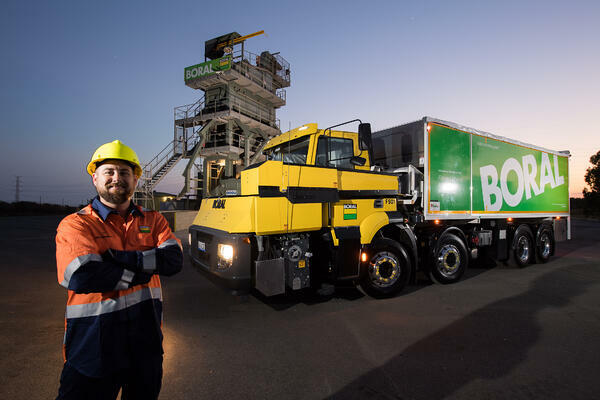 Boral has unveiled a new road surfacing truck to make the task safer for workers, increase product quality, help to reduce infrastructure costs to road agencies, and further cement the company’s innovation credentials. The launch was held at ARRB's headquarters, the National Transport Research Centre, in Port Melbourne earlier today. The new Boral FMAS, a Forward Moving Aggregate Spreader, revolutionises the method of spray seal road construction in Australia. The Boral FMAS is the first in Australia, locally designed and engineered by Boral. Until now, the process involved road crews working with reversing trucks that applied the aggregate through an elevated tipper body, increasing the safety risks to workers. 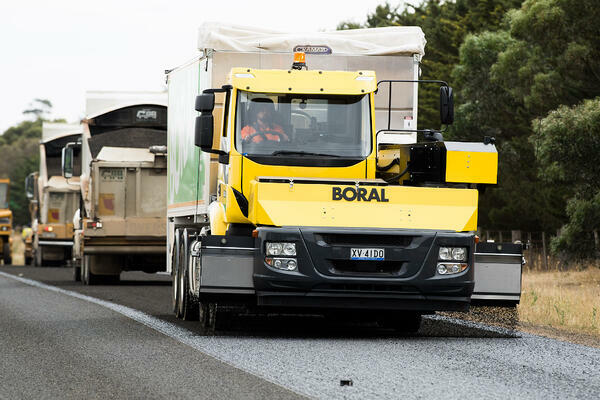 To improve safety and maximise visibility, the Boral FMAS disperses aggregate from the front of the truck via a conveyor belt and spreader box. The forward moving operation allows for clear line of sight for the operator. There is no requirement for reversing or tipping which minimises risk to people and infrastructure. The Boral FMAS meets Australian Design Rules and can be legally driven fully loaded on all Australian roads without permits. The Boral FMAS design enables quicker completion of works, and significantly reduces any potential infrastructure and overhead damage such as contacting power lines, trees and bridges. 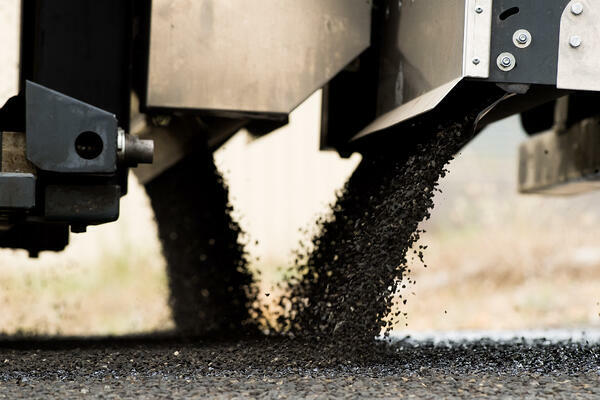 Stuart Partridge, Boral’s National Asset Manager – Asphalt, said Boral designed and developed a Forward Moving Aggregate Spreader following a call to industry by the Victorian roads authority – VicRoads – as a result of a serious accident involving a VicRoads worker some years ago. 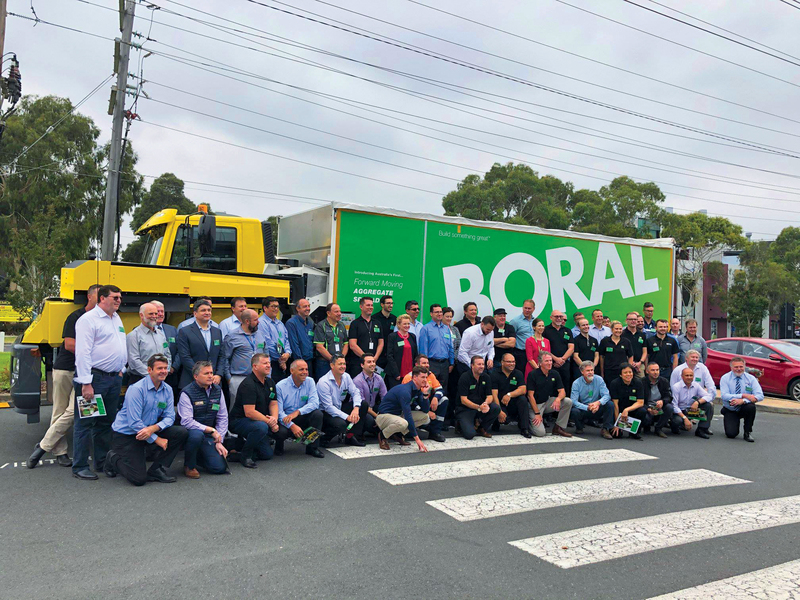 Boral Australia Chief Executive Joe Goss said the new Boral FMAS was a demonstration of the company’s commitment to zero harm, placing the safety of all employees and the community in general, at the very centre of the company’s mission. From left to right: Dr Collette Burke, Chief Engineer of Victoria, Joe Goss, Boral Chief Executive, John Esnouf, VicRoads Principal Engineer - Sprayed Seal Technology, Michael Caltabiano, ARRB CEO and Stuart Partridge, National Asset Manager - Asphalt standing in front of the new Boral FMAS. 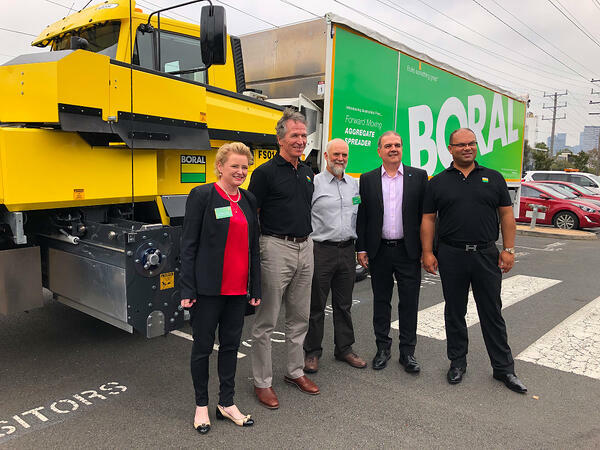 ARRB CEO, Michael Caltabiano, Dr Collette Burke, Chief Engineer of Victoria and VicRoads Principal Engineer - Sprayed Seal Technology, John Esnouf, were among more than 80 guests for the Boral FMAS launch at the National Transport Research Centre. Click below for more information on the Boral FMAS and to read the full media release. All images courtesy of Boral.